You use the Magic Extractor command in Photoshop Elements 11 to make selections based on your identification of the foreground and background portions of your image. Specify the foreground and background by clicking these areas with the Brush tool and “marking” them. 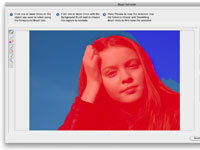 Click the magic OK button, and your object or objects are neatly and painlessly extracted. Make a rough selection first before selecting the Magic Extractor command. This technique, which isn’t mandatory, restricts what’s extracted and can result in a more accurate selection. 1In the Photo Editor, in Expert mode, choose Image→Magic Extractor. The Magic Extractor dialog box appears. 2Choose the Foreground Brush tool from the dialog box and then click or drag to mark foreground areas — the areas you want to select. The default color of the Foreground Brush is red. The more accurate the data you provide to the command’s algorithm, the more accurate your extraction. Be sure to use the Zoom and Hand tools to help magnify and move around your image as needed. You can also change the size of the brush tip (from 1 to 100 pixels) in the Tool Options area on the right side of the dialog box. If necessary, change the color of the foreground and background colors by clicking the swatch and choosing a new color from the Color Picker. 3Select the Background Brush tool from the dialog box and then click or drag to mark the background area — the portions you don’t want to select. The default color of the Background Brush is blue. 4Click Preview to view your extraction. 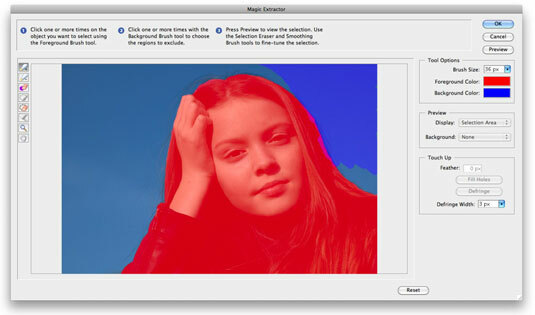 You can change the preview by going to the Preview section of the Magic Extractor dialog box and choosing either Selection Area or Original Photo from the Display pop-up menu. 5If the extraction needs more accuracy, refine the selection with the help of the Magic Extractor tools set, located along the left side of the dialog box. If things start to go awry, you can start over by clicking Reset at the bottom of the dialog box. 6When you’re pleased with the results, click OK to finish the extraction process and close the Magic Extractor dialog box. Your newly extracted image appears as a new image.